Usage Based Billing, the big ISPs push for Wireless like profits. I've had several discussions recently about wireless carrier pricing. The more I thought about mobile pricing strategy, the more I realizes what UBB was really about. Rogers and Bell are both making huge amounts of money off of their wireless cell phone businesses. In fact, Canadian wireless carriers have some of the highest profits in the world. Why is this? Partially because of lack of competition. Yes, there are three national carriers, Rogers, Bell and Telus. But Bell and Telus are joined at the hip (they share their network), leaving just Bellus against Rogers. Things are changing with the new entrants, but the core of their success is based on the business model that is prevalent in a lot of North American carriers. All the major North American carriers have a pricing model which is designed to discourage pay for what you use pricing. They all have packages with allotments of minutes and/or bytes of usage. If you go over what your package contains, you are charged obscene amounts in overage charges. These charges are designed to force you into a package which you may not ever come close to using, but will gladly have so you don't get that wonderful two, three or more times your regular bill overage charge. A lot of Americans overpay for cell phone usage as a result. So these large carriers in Canada are making money hand over fist in the wireless space. Now they want to bring those profits into their Internet business. So what better way than to put up a smoke screen claiming that bandwidth is getting more precious, just as it's getting cheaper elsewhere in the world? What's worse, is that wireless and land line infrastructure are very different. Wireless frequency allocation is actually a controlled, some might argue artificially scarce resource. Not so with land lines. The only thing scarce about them is that there are a handful of companies that own the last mile infrastructure, and they feel it's their's to overly restrict. Bell's UBB pricing policy, which was being forced onto independent ISPs who lease the last mile access, had ridiculously low usage allotment, with the option to buy "usage insurance". If you think you are going to go over, buy these packages of extra usage and we won't charge you our crazy high overage rates. So instead of actually being billed for your usage, where if you used less, you'd save money and if you used more, it would cost you more, based on a reasonable markup, we have a situation that mirrors the wireless industry. High overage fees with higher usage packs. Soon we'll all be overpaying for our Internet access. Of course, it's actually worse for a lot of users, as no packs were offered to cover what some people used. This video pretty much shows how ridiculous the usage based billing situation is getting. Our tubes are too clogged. We're all hogs that need to be punished. The CRTC and Bell Canada both need a good kick. There was a line in my post from the weekend which I removed on a friends recommendation. I'd like to talk about the idea in that sentence. Before I do though, I will point out as my friend rightfully did, that this is my opinion. I have no proof to back this up, only a chain of events that make it more clear in my mind. Bell Canada doesn't want you using their Internet for anything that would harm their other sources of revenue. They don't want you using VOIP because that harms their existing telephone and long distance business. They don't want you using Netflix because then you're not using their satellite or IP TV services. In a hearing over a year ago at the CRTC, on the traffic management practices that Bell uses to slow down your Internet connection, the CRTC asked Bell for proof of the congestion that required this. Bell complained that they couldn't provide this proof because how their Internet works was a trade secret. Eventually they were compelled to provide this proof and submitted a very lengthy document. This document was long and full of non-essential information. At the end of it all, it showed that there was a < 1% probability that at some point during a one year period a couple of their aggregation points were congested in their busiest locations in Toronto. Their proof was not very convincing if true. And most importantly, showed that an upgrade of a couple of their aggregation points would have solved the problem in the affected areas. Furthermore, the period we're talking about is from a time where usage caps were higher. What's even worse, is that Bell spent millions on improving their infrastructure, not to mitigate traffic congestion that they claim existed, but so they could offer IPTV through their Fibe service. 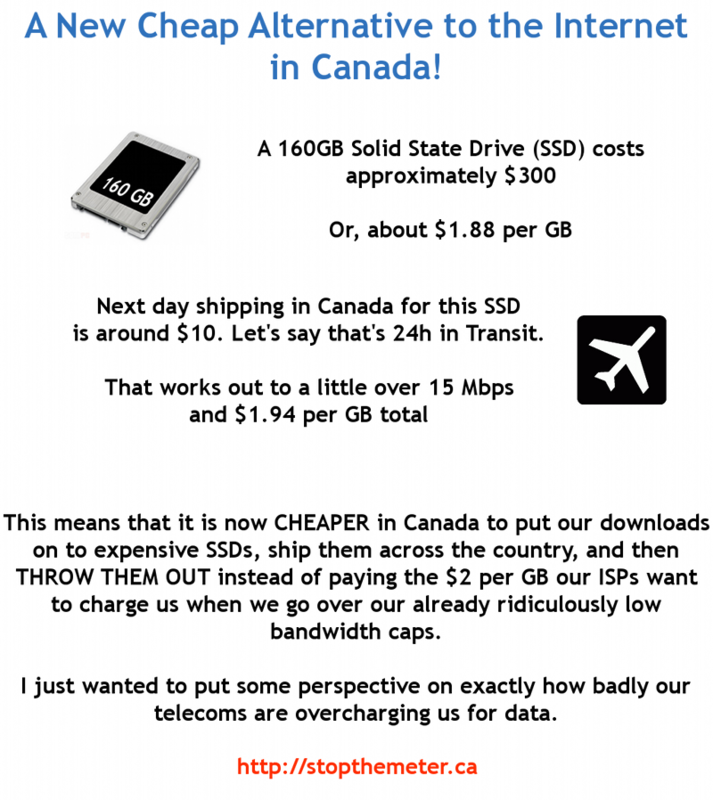 Bell actually wants you to beleive that it's more expensive to send 160GB over your internet connection then mail it. The reality is that providing usage, which is not to be confused with the speed of the usage, is incredibly cheap and getting cheaper. Another large company, Telus will have you believe that things in Canada are great. However, a cursory glance will show that we pay more for less than almost any other developed country. Of course Bell has many devisions, and I cannot believe that they they wouldn't try to maximize profits in all of them. They make no money of the content you consume on the Internet. That really doesn't sit well compared to all their other divisions. The CRTC in their aforementioned traffic shaping ruling, told Bell that they should use economic incenetives to discourage heavy usage. And now here we are with UBB. If you listened to the Traffic shaping and UBB hearings at the CRTC, which are available live from the CRTC website, you can immediately tell that the CRTC only believes Bell. If you hear Rogers or Shaw or any of the 3rd party ISPs talk, they are met with scepticism and asked to prove all of their statements. When Bell speaks, their word is taken at face value or, in the rare occasion when proof is required, their proof can be week and still pass mustard. Today, the Head of the CRTC stood in front of the commons and repeated exactly what Bell has been telling them over the last year. "We are convinced that Internet services are no different than other public utilities, and the vast majority of Internet users should not be asked to subsidize a small minority of heavy users. For us, it is a question of fundamental fairness. Let me restate: ordinary users should not be forced to subsidize heavy users." That's right, the ISP model, that has worked successfully for over a decade, is unfair and must come to a stop! We must preserve those precious bits so they don't get all used up by the heavy users. It's unfair. Someone please fire this man as soon as possible. He doesn't understand what he is saying, can't hire someone who can explain it to him, or is being paid off by Bell. I cannot accept any other explanation for this stupidity.